Dr. Larry Tripp, Dalton Public Schools work-based learning coordinator, was among 35 career and technical, and agricultural education educators who were honored by the Georgia Association for Career & Technical Education during its annual summer conference at the Classic Center in Athens, Ga. The conference was attended by more than 1,859 CTAE educators from around the state. Nominated by their division peers and selected by the GACTE Awards Committee, each nominee was presented with a plaque naming them as their division’s 2018 nominee for Georgia Association for Career and Technical Education Teacher of the Year. 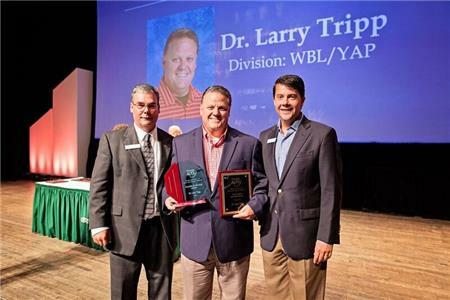 Dr. Tripp was then named the overall state award winner and honored with another plaque and a check for $500. He will represent Georgia in the Association for Career & Technical Education Region II competition in September. Dr. Tripp is the district work-based learning coordinator and is based at Dalton High School. An educator for more than 24 years, and beginning his sixth year with Dalton Public Schools, he earned his Bachelor’s and Master’s degrees from the University of Georgia, Education Specialist Degree from Lincoln Memorial University in Harrogate, Tn., and his Doctor of Education from Argosy University in Sarasota, Fl. Dr. Tripp will also be appropriately recognized by the Dalton Board of Education on Monday at 6:30 p.m. at the board’s regularly scheduled meeting.